That special effect was straight out of Mars Attacks. Which one? The shot of the island? I'd assume that was the shot of the Frankensteined former prison manager. Super creepy and kinda fake-looking! And I like how Fish now has a sufficiently unusual physical feature for her to be believable as a Batman villain. Now that you mention that long shot pullback, Fish Mooney seems to have stumbled into the filming of a Repo: The Genetic Opera sequel. 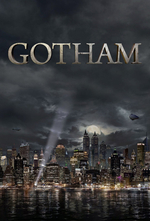 Pretty solid episode for Gotham. I wonder what the Penguin's angle is in letting Ma & Pa Kettle go? I doubt he let them get the drop on him. He's a little weasel, but he's a vicious little weasel with a scattergun. The Fish's Eye subplot worked out exactly as I thought it would, but I'm sad that Gotham already took Jeffrey Combs off the board. Between this and Julian Sands, casting fantastic genre-favorite actors in all-too-short-lived roles is beginning to look like a heartbreaking trend (I'd include Mark Margolis, but I'm guessing he will be back). So who's next? Brad Dourif? hah, turns out I dozed off before the episode was over and missed the denouement with Ma & Pa.
Everyone's looking a little more outlandish, a weird body-horror scene, some more gothicky horror.